Ntel Network is presently at Abuja and Lagos, and about to enter other cities in Nigeria. As of recent, a friend of mine told me that the network is about entering Port-Harcourt (PH city), that is to say, those in PH get ready to use the network by knowing the tariff and data plans with other things concerning the network, before it lands your area. Ntel decided to come up with a new and first time data and tariff plan to Nigerians, having their 4G Network intact for its usage. The 4G network is such that is very fast when browsing with it. 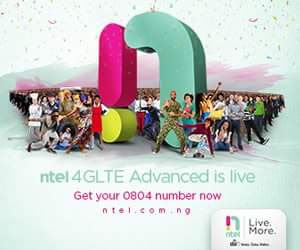 Are you a heavy file downloader, this 4G network and the unlimited data plans from Ntel is suggested as the best for you. >>And the validity is 3 days only. >>And the validity is 30 days. More has been added from the latest device launched by several phone brands. Time for you to use it. Tell us your experience, if you are using it already.